Knowledge Guru allows you to customize how often players can access your Quest game. Game spacing can be a critical component of successful learning design. In fact, the key to long-term memory formation is not the amount of time spent learning, but the amount of time between learning. Use the default when you simply want people to play through the entire game at one time and you are content with a “micro-spaced” experience where people encounter repetitions of content within minutes. 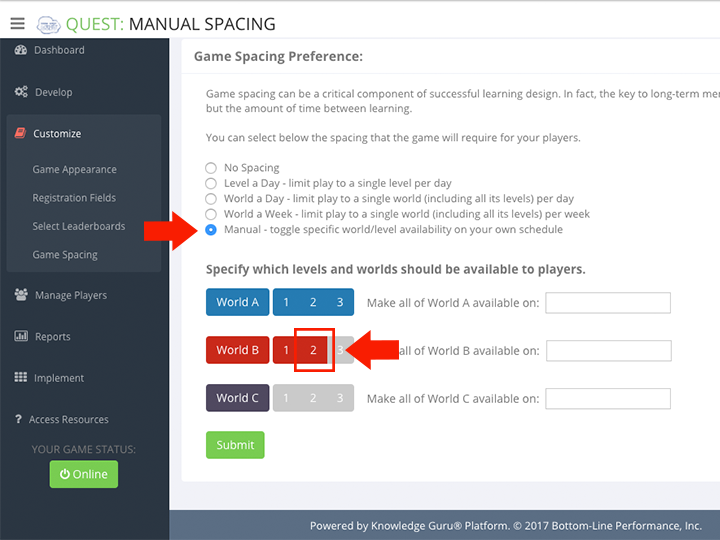 Use “Level a Day” when you want to maximize game spacing and ensure that people encounter repetitions of content several days apart. 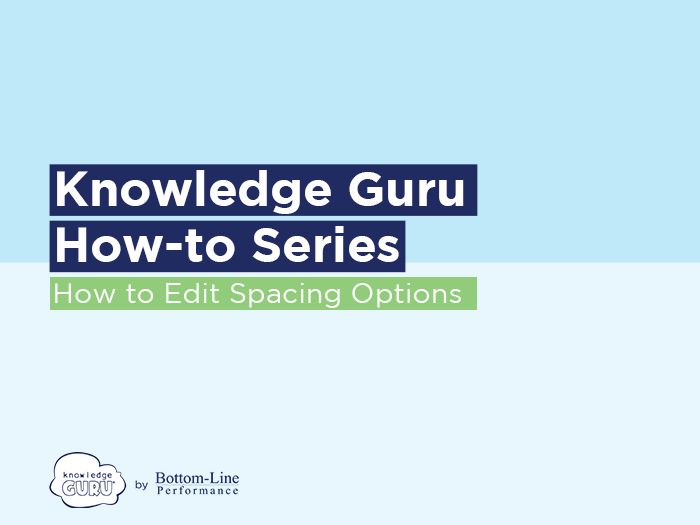 This spacing is ideal for creating a microlearning experience. 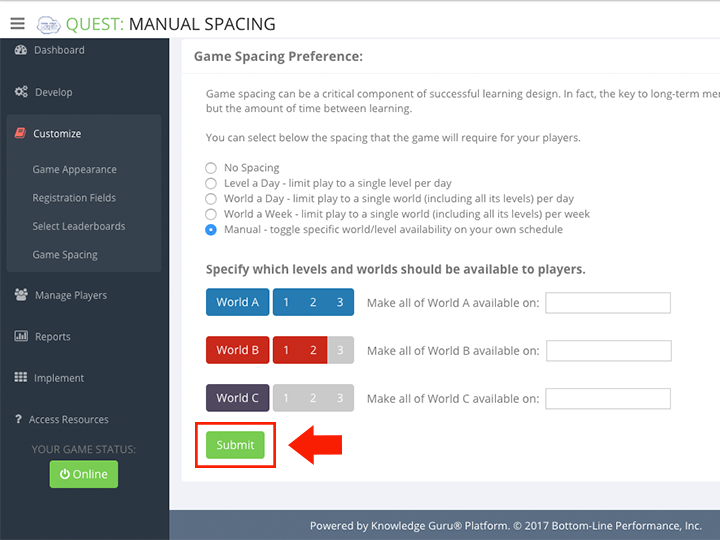 “World a Day” may be a good option if you want learners to get through all the content quickly, but still want to provide some level of spacing. It also works well when setting up a short, time-based competition. 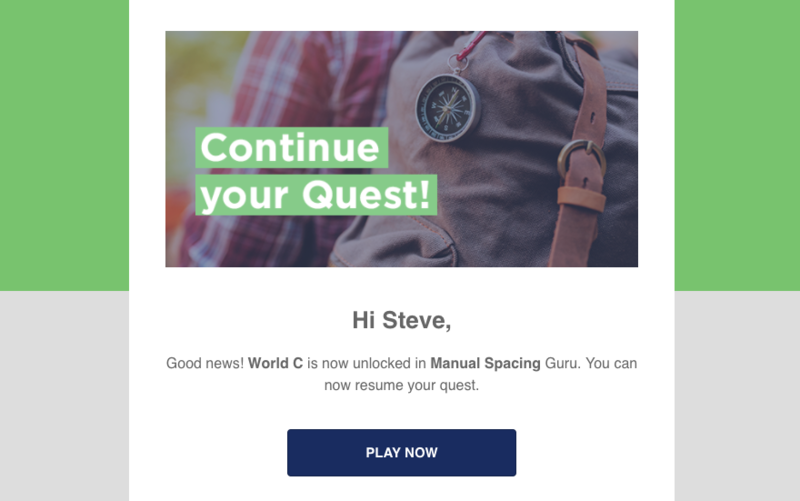 “World a Week” works particularly well if you use a Quest game as part of a multi-week course. Use it when you want to maximize game spacing and ensure that people encounter repetitions of content approximately 8 days apart. Research supports this spacing as being highly effective. A level of day also works well as a post-training reinforcement. 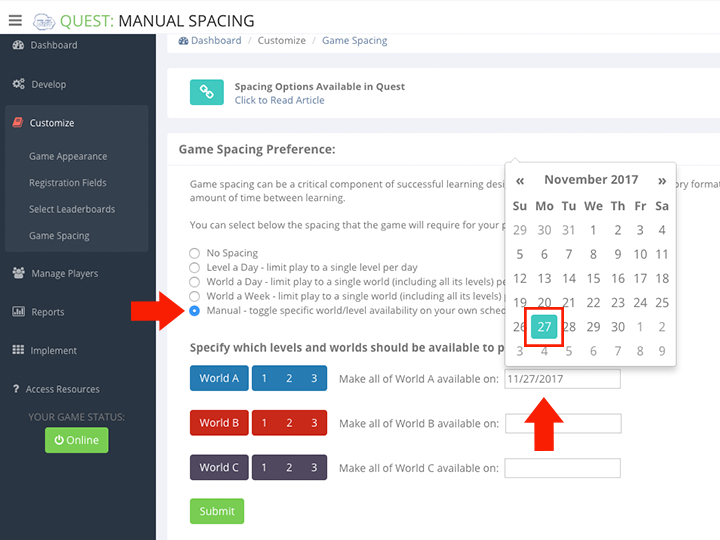 Authors have the option of adjusting level availability or they can schedule an entire world to unlock at a future date. 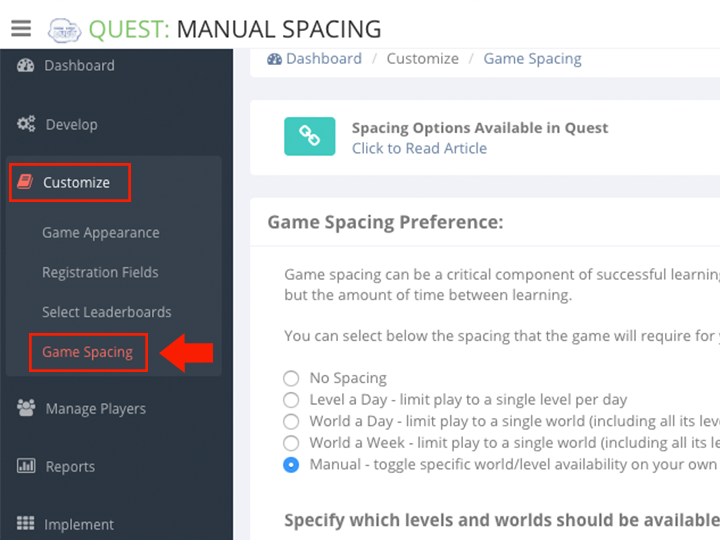 You can learn more about manual game spacing options in the article How to Manually Lock and Unlock Levels and Worlds in Quest. 1. 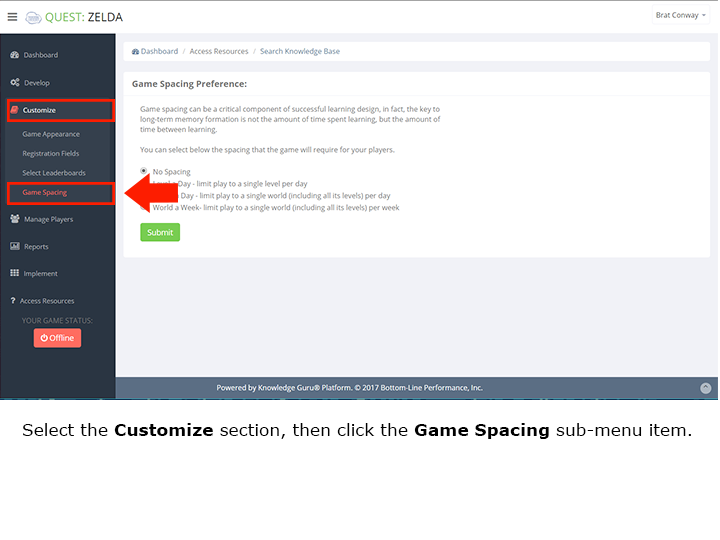 Select the Customize section in the left-hand menu, and choose Game Spacing. 2. 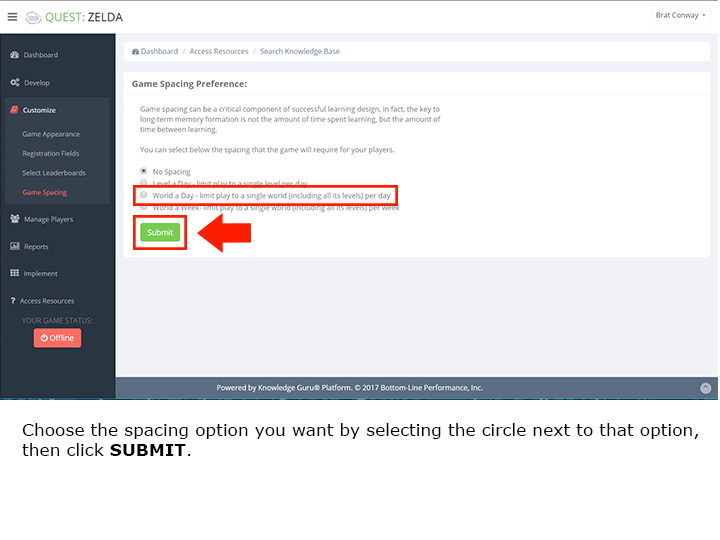 Choose the spacing option you want by selecting the circle next to that option. Leaderboards are a great feature in the Legend and Quest games that creates a fun, competitive environment. You might want to use certain leaderboards for certain instances. For example, if you want to have a company wide competition, you can select leaderboards such as Global High Score or Player’s Location High Score. If you are holding a competition between different groups in your company, you might want to set up custom leaderboards like Branch vs Branch, Supervisor vs Supervisor, or Job Role vs Job Role. Choose to use all of the leaderboards (the default) or choose one or two. Be aware that the first custom registration field you have in your game links to a leaderboard. This can be helpful if you want to display results in a leaderboard by location, by team, by role, etc. Follow these steps to learn how to select Leaderboards. Select the CUSTOMIZE option from the left-hand menu. 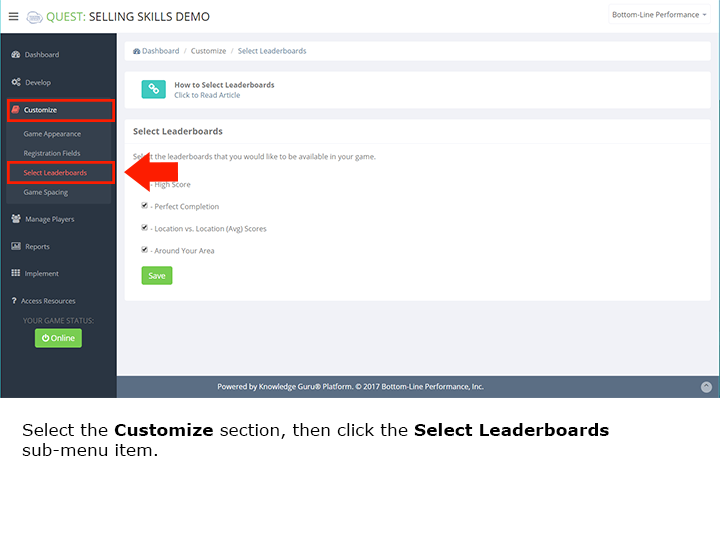 From within the CUSTOMIZE section, choose Select Leaderboards. Make sure the leaderboards you want have a check next to them. 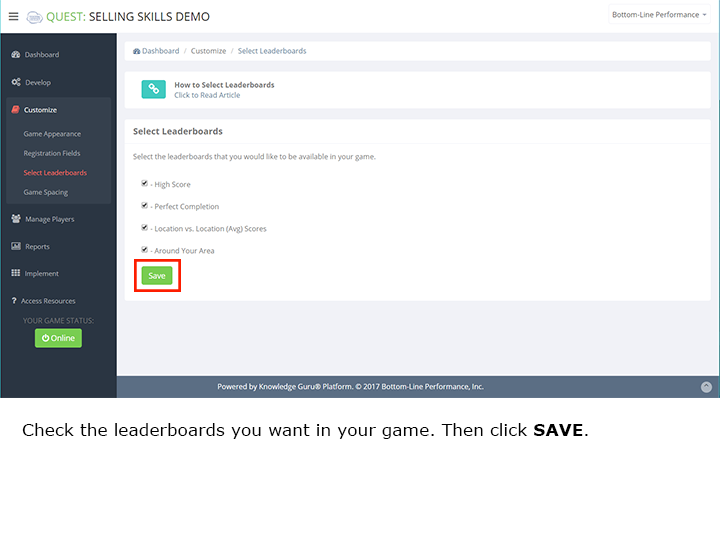 After selecting the leaderboards you want, click SAVE. Select the CUSTOMIZE section in the left-hand menu. 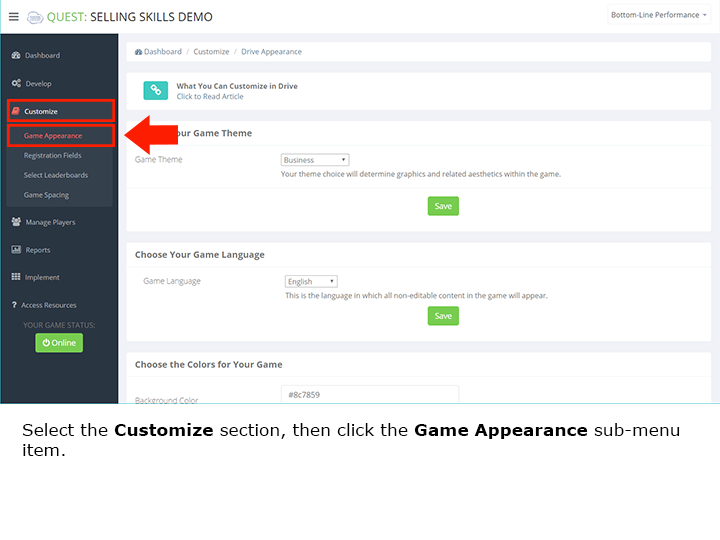 From within the CUSTOMIZE section, select Game Appearance. Locate the logo field near the bottom of the page. Click the CHOOSE FILE button. Click UPLOAD. You will see your new logo on either the splash screen or in the top left corner. 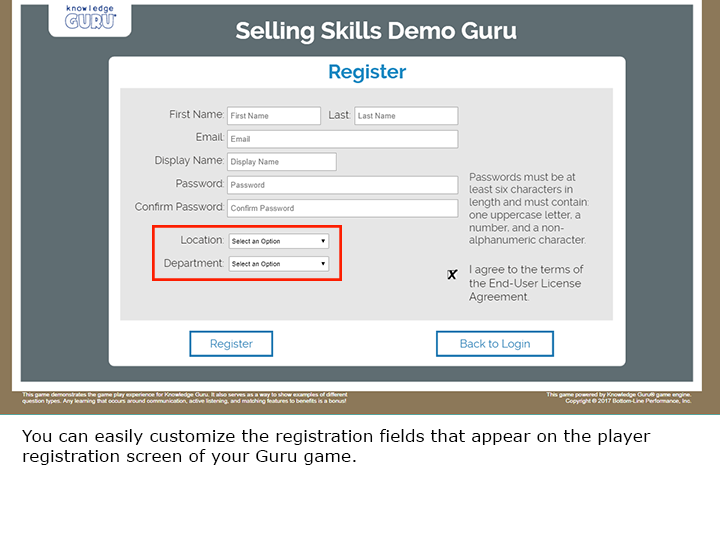 The Knowledge Guru authoring tool allows you to create a game that’s unique to your organization by customizing it with names, logos, colors, registration fields, footers and more. Quest includes three different themes that slightly adjust the look and feel of your game. These themes are Business, Island, and Space. Legend includes eight different game themes. Expand Customize option within left-hand navigation pane and select Appearance. Select the Game Theme you want from the drop-down menu. You may need to clear your browser cache before the new theme is visible. Visit your game at kguru.co/GAMENAME to see the new theme. If your Knowledge Guru subscription includes language support, you will have the ability to change the language in which your game content appears. Options are Chinese, English, French, German, Italian, Japanese, Portuguese, and Spanish. Select the Game Language you want from the drop-down menu. You may need to clear your browser cache before the new language is visible. Visit your game at kguru.co/GAMENAME to see the new theme. Note: your language will be applied to the player experience, NOT the admin experience. Every Knowledge Guru game comes with a default color palette. If you want to change that color palette to reflect your organization’s colors and branding, follow the steps below. 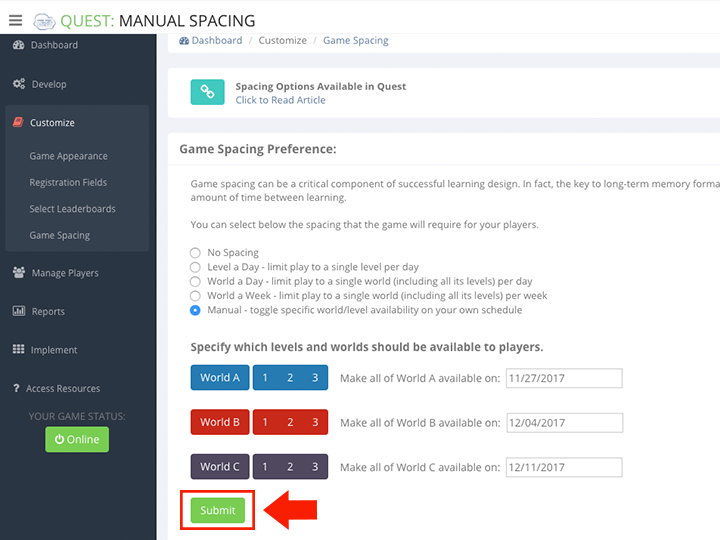 In the field labeled Choose the colors for your game, you can customize your game’s branding with two different colors. Next to Background Color, enter a color code or click the field to access a color-picker to choose the primary color for your game. Repeat this step for your Footer color. You may need to clear your browser cache before the new language is visible. 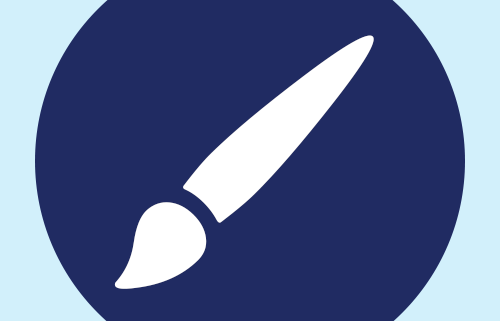 Every Knowledge Guru game comes with its own default logo. Follow the steps below to change the default logo to a custom logo. Quest and Legend games can include custom text in the game footer. Use the steps below to edit this text. 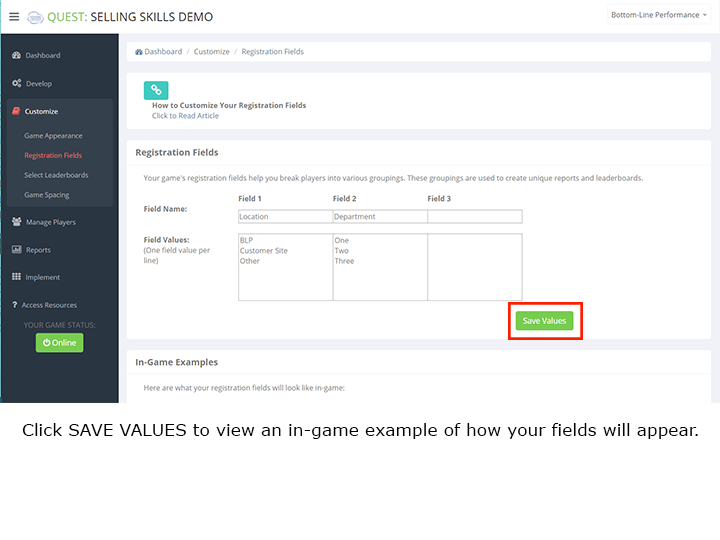 From within CUSTOMIZE, select Game Appearance. Locate the footer text field at the bottom of the page. Type your new text in this field. Click the SAVE button. You will see your new text in the game’s footer. When you implement a Guru game, you may want to filter your game data by specific criteria – or set up a competition in a specific way. For example, you may want to be able view game results by team, by location, or by job role. You might want locations to compete against each other or for teams to compete against each other. 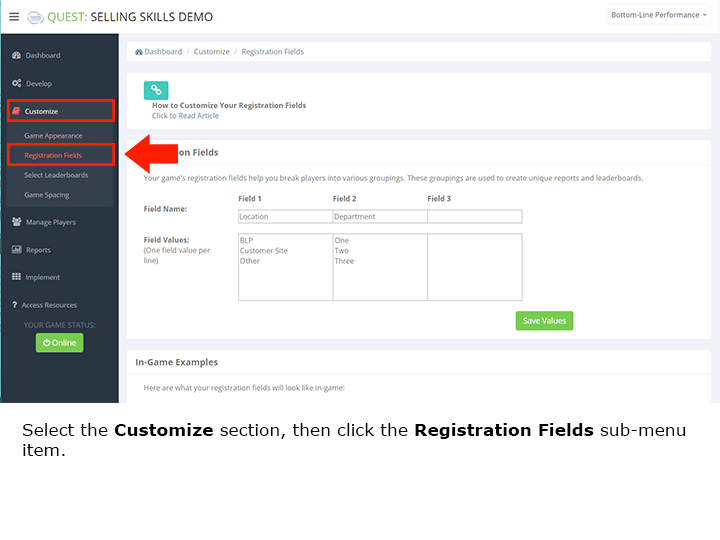 To enable either of these things to happen, you need to customize your game’s user registration fields. The slideshow below shows you how. Go to the CUSTOMIZE section in the left-hand menu. Type your desired drop-down menu title (such as Team, Role, etc.) in the space available for the menu name. Notice that the default name is Location. If you do not want a registration field to appear at all, make sure that there is no text in the field for the menu name or the menu options. 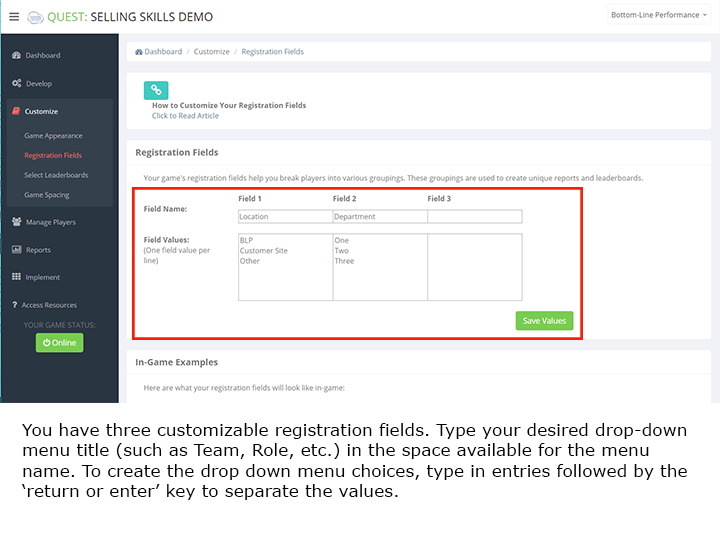 The registration fields you enter will create custom leaderboards and reports associated with those leaderboards.